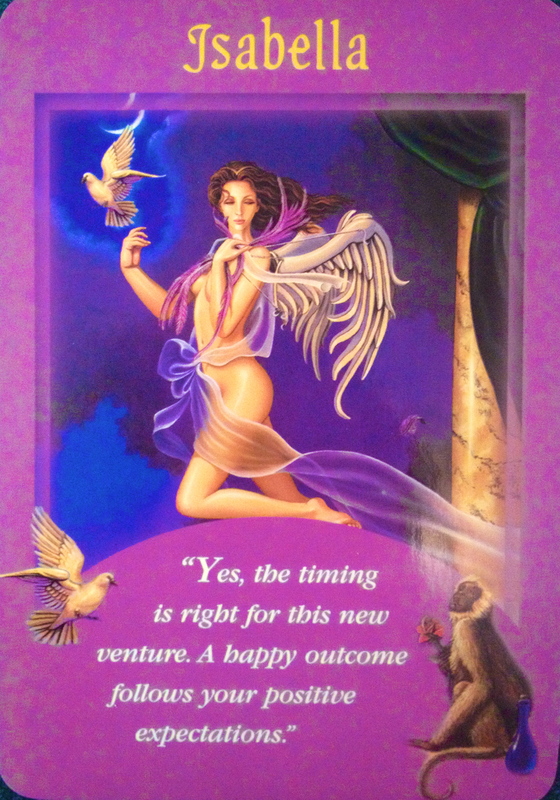 Daily Angel Card ~ Isabella “Yes, the timing is right for this new venture. A happy outcome follows your positive expectations. Angel Card Isabella: “In answer to your question, yes, this situation is everything that you hoped it would be. It is still a good idea to keep your eyes open and pray for angelic assistance along the way. Even ideal situations require adjustments as you move forward. However, we angels foresee smooth sailing with this decision. Sometimes we have an idea that inspires us but we just aren’t sure how we are going to make that dream a reality. Sometimes fear gets in the way, ego takes over and the dream dissipates. This is not one of those times! The angels are here to support you, and Divine timing is underway. Listen to your heart and intuition to get messages from your angels and guides. You can tell if a message is from your angels if it’s a nagging and repetitive feeling that is linked to a concise thought. It will continue to nag you and the feeling will get stronger and stronger, pushing you in the direction that is most beneficial to you. Tapping into these messages is easier when you are receptive. Open up to be receptive by asking for help and then staying silent, waiting for the answers. Spend time in nature, connecting to the earth. Use Clairaudience, which is hearing Divine messages in the earthly realm… the lyrics of a song that pops into your head or comes on the radio and answers a question, or overhearing a conversation in a coffee shop that just happens to pertain to your situation. Synchronicity, signs, Divine intervention, it’s all connected and it’s amazing to be a part of it. As your consciousness becomes higher and your vibration higher, it will get easier and easier to tap into your connection with the Divine. It’s in every single one of us, we just have to choose to access it. Set your expectations high at this time, as life is about to manifest your desires. This is just the beginning of abundance and prosperity. The angels are on your side, as they always are. Don’t forget to express gratitude, as gratitude is the secret, the key ingredient to joy, and pulls you into the present. Use your breath to ground you, as John Holland would say, “Breath is power” the power to focus your mind, manage your thoughts, ground yourself and raise your vibration. Big deep breaths, right from your belly will help you. Try it now! *Messages From Your Angels Oracle Cards, Doreen Virtue, Ph.D. I had a vison of a woman named Isbella. I never heard that name before. Maybe she was trying to tell me something. I hope she comes back to me.